Blueberries, Art and Life: I'm in love...... with No Knead Bread! I'm in love...... with No Knead Bread! This past week, during my "spare time" (ha! read that as "stress relief" time) I decided to do something I've wanted to do for a long time - bake some homemade bread. Homemade, handmade - without using a bread maker. I recently gave away my bread maker anyway. 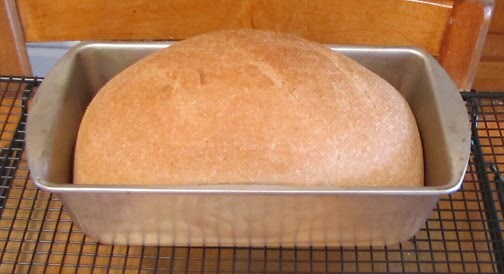 I first made a loaf of Whole Wheat bread in the traditional way. You know, knead it for 10 - 15 minutes (what a workout for my poor wrists! ), let it rise, punch it down, let it rise again, then shape and bake. It was really good and we liked it. This is the second (oblong) loaf pictured. But then I found an article about No Knead Bread as baked by Chef Jim Lahey of Sullivan Street Bakery in New York. And, oh my, what heavenly bread! ( top photo - the round loaf). We more than liked it.... we loved it! If you like a crusty bread this is the one for you. 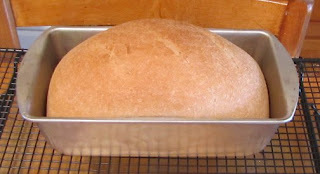 (If you like a softer bread, after it's cooled store it in a plastic bag and it won't retain such a crispy crust). It's SO simple to make... and there really is no kneading (stir to mix, a couple of folds, one quick shaping and that's all). Instead of your hands doing the work, time does the work instead. You mix it up and let it sit for 18-24 hours and, according to Lahey, the long slow rise time is the secret to this artisan bread. It has the most wonderful crust and a great texture inside with all these irregular shaped holes. Slather some healthy butter substitute on it and top with raspberry jam... oh me! Or drizzle with olive oil, sprinkle with garlic powder and toast...... mmmm! If you decide to give it a try and, like me, you only have access to "down home" grocery stores, Rapid Rise yeast by Fleischmans is the same as instant yeast. Fresh baked bread, kneaded or not kneaded or by bread machine is always welcome at my house! Great start to your oil painting!! Ohhhh...that bread looks delicious! I'm going to give it a try--we all love crusty artisan bread here. You have nice blog Teresa! Wow, no kneading -my kind of bread! Thanks for sharing your delicious discovery! Hi Teresa, Your WIP oil painting looks like a beautiful start and the bread looks absolutely delish! Hope you are doing well! 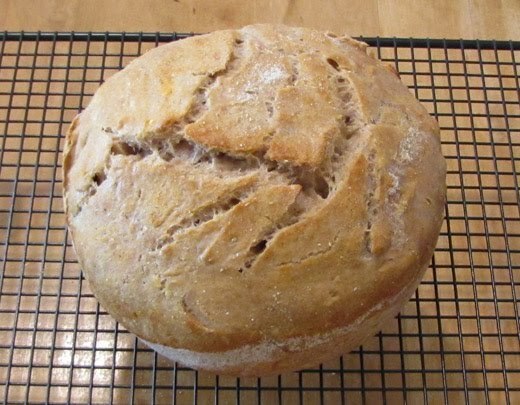 I've been hooked on artisan bread since I got the book, Artisan Bread in 5 Minutes a Day, which is also a no-knead method. Too easy and it does taste so good. Yours looks wonderful! So does your painting - great start! Gotta try it! great start to your painting! thanks for visiting and writing on all those posts of mineT....you are terrific. I love making bread, I'm going to try the recipe! Je vous souhaite une bonne progression pour votre toile. Merci de nous en montrer son évolution. The lighthouse looks great. 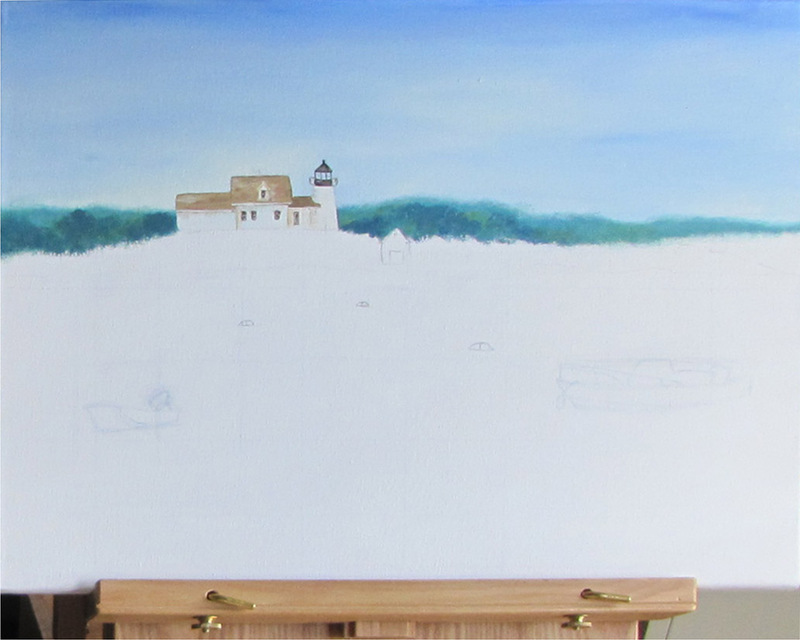 I can't wait to see the completed painting. Amazing bread. I can smell my mother's smell from it. Not fancy but simple and warm. Your painting looks great. I can smell the bread ... yummy. I Love to follow your WIP!